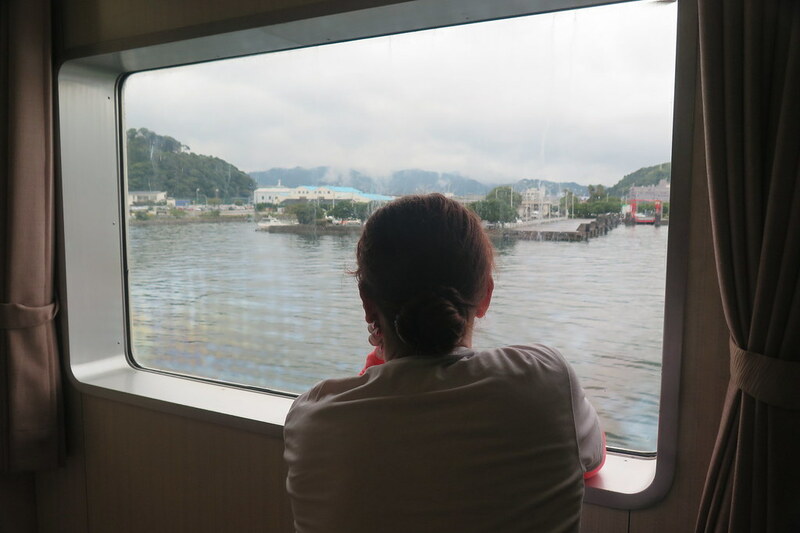 When we arrived into Saiki port on the ferry, we had two options. 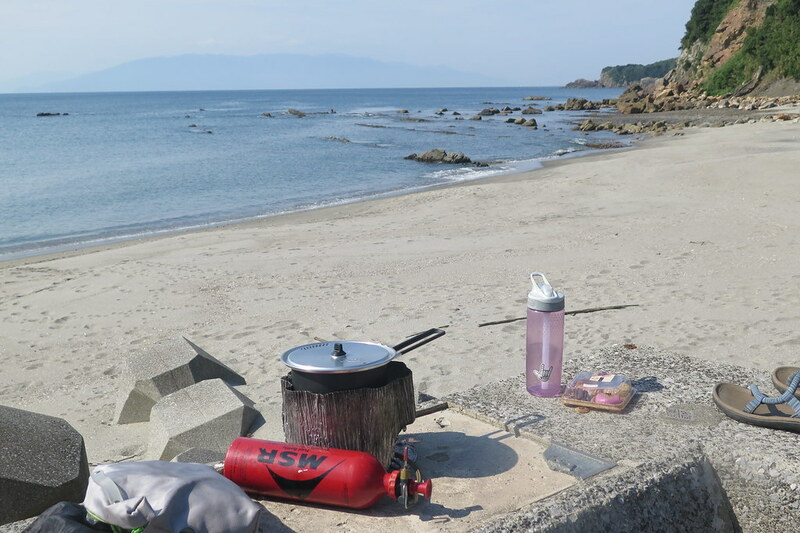 Either stick around and find a camp spot near the port, or push on through the hills to get to a beach 35 kilometres to the south. It was around 1:30pm when we docked and the rain had stopped so we decided to push on and get cycling. It wasn’t long before we were having second thoughts though. A strong headwind was slowing us down, and the hills looming ahead were looking steep and tall. It was a long climb that wasn’t much fun for either of us, especially as the grey clouds were starting to roll in again. Reaching the top and starting down the other side, glimpses of the coastline ahead of us started to raise our spirits though. A long winding descent which would’ve been much more enjoyable had the road been dry took us down to a small fishing town. 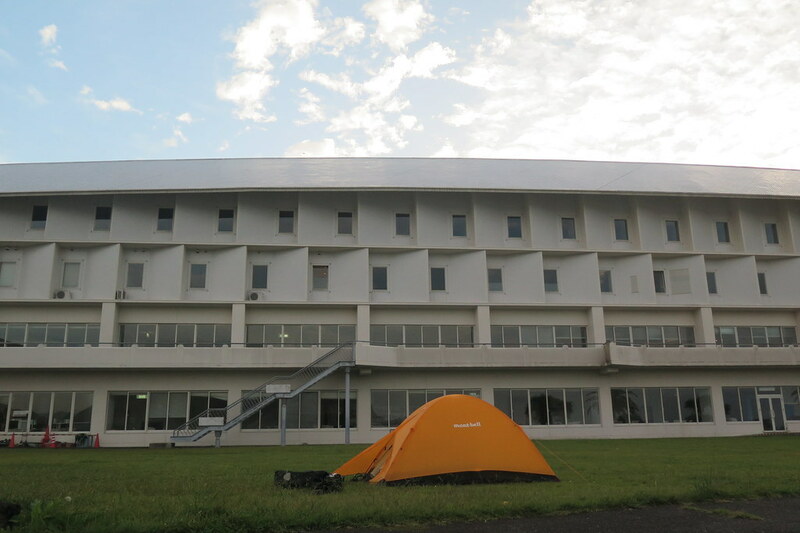 From there, we had another 10 or so flat kilometres to get to our camp spot at Motosaru. This road hugged the coast taking us through small bays and coves then then emerged through a tunnel onto a sheltered beach surrounded by high cliffs. At one end of the beach was a large white building labelled on the map as a ‘Marine Culture Centre’. We never really figured out what its purpose was, but it had free wifi and a flat lawn area outside where we pitched our tent. Cooking our dinner looking over the bay, a fisherman came by and we had the standard chat about where we’re from and where we’re going etc etc. Then he came back half an hour later or so with some fresh fish that he’d grilled for us! Around that point, the skies cleared and we had an amazing sunset to accompany our dinner. 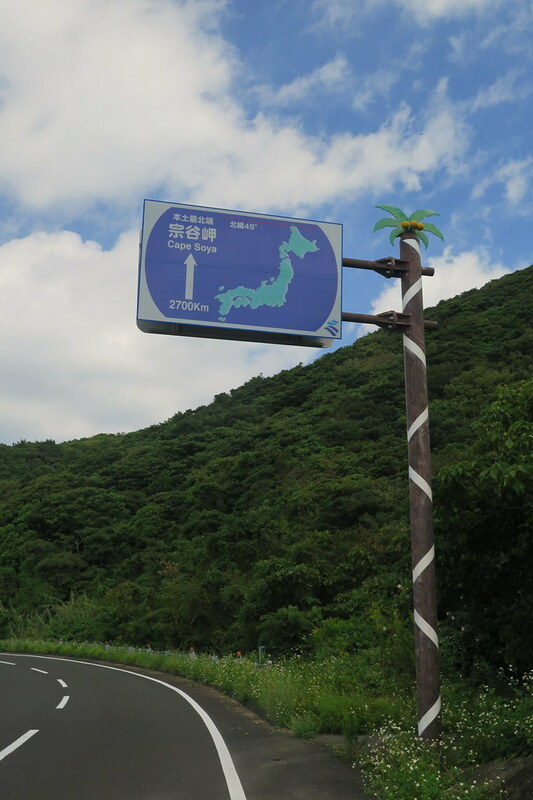 We were starting to get some good vibes about Kyushu. That night, the Culture Centre’s caretaker saw us in our tent and came out to warn us about the rain and wind that was forecast, but said it was ok for us to be there. During the night, we did indeed get rain, with some very strong winds that shook the tent and howled around the cliffs above us. 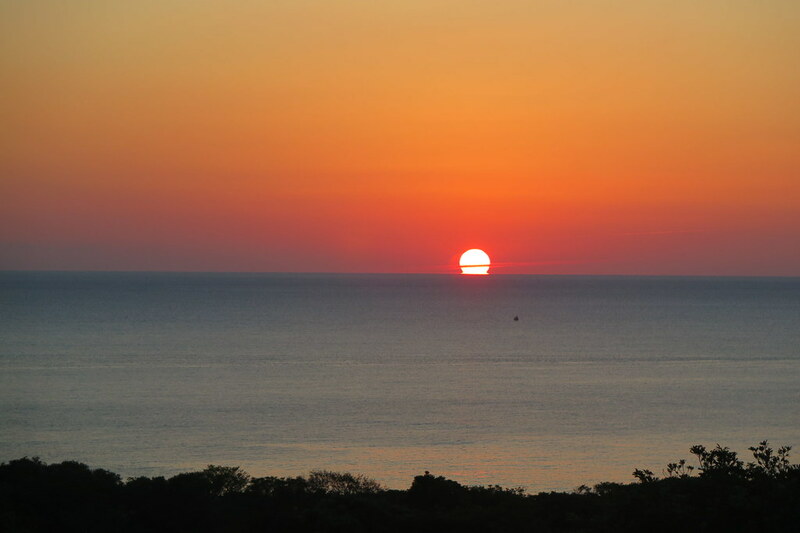 Then, at six the next morning, we heard a stern ‘ohayo gozaimasu’ (good morning) from outside. The caretaker was back, with backup, asking us to please pack up and move along. Not exactly sure why the camping policy changed overnight, but an early start was good. 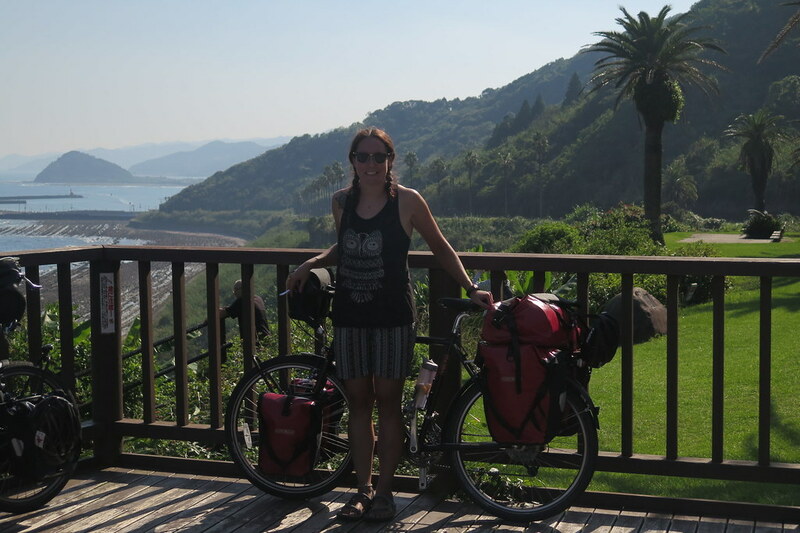 The riding from here looked like it’d be tough, with steep and windy coastal roads. We set off without a destination in mind, just with the intention to head south along the coast and see how things turned out. And so began the best few days of our trip so far. The tiny unnumbered roads were as steep as expected, if not steeper, but the views from the cliffs and the beauty of the coastline blew us away. 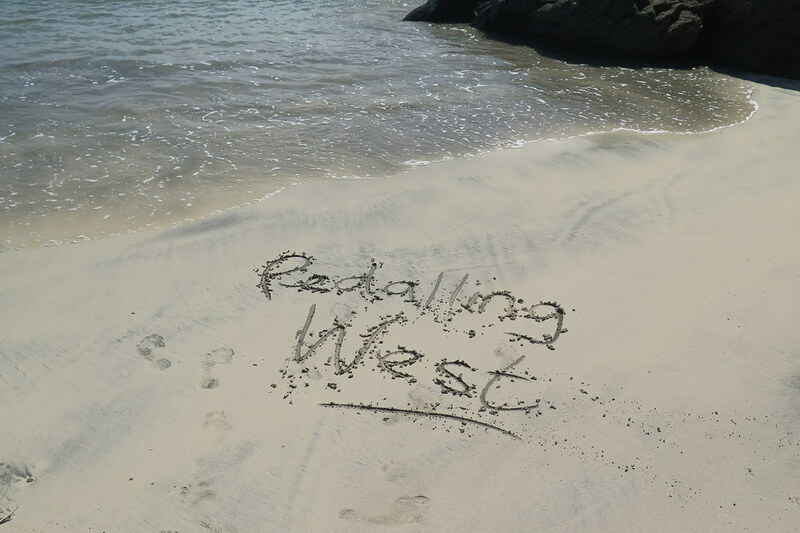 We really took our time through the first morning, stopping for a long break and a swim on a deserted white sand beach. 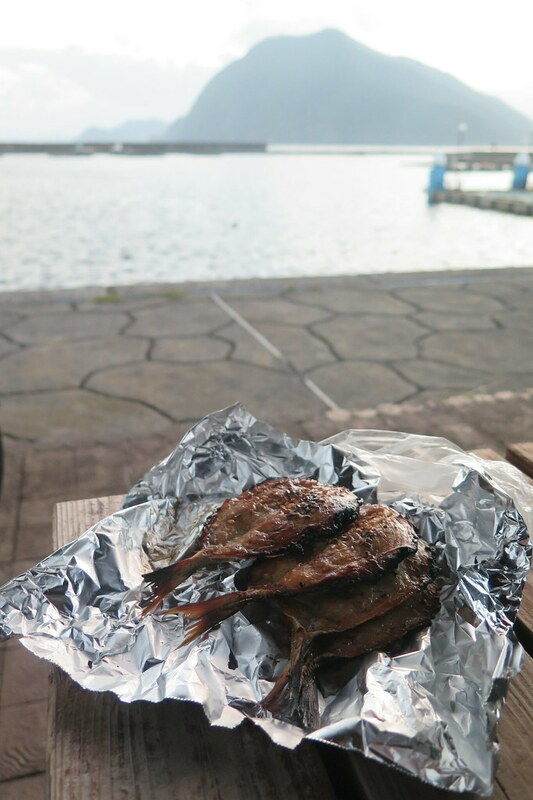 Then we had sashimi for lunch at a michi no eki next to another beach in Kitaura. 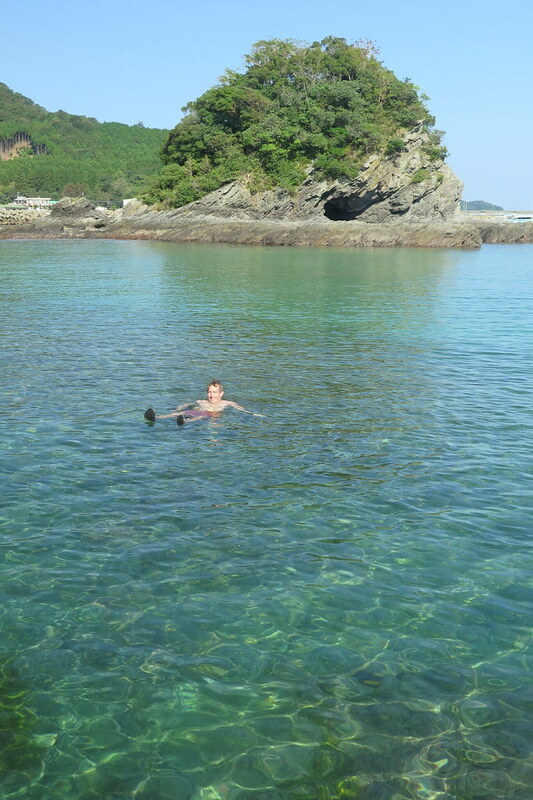 Being October, it’s outside Japan’s standard swimming months of July and August so we had these amazing spots completely to ourselves. 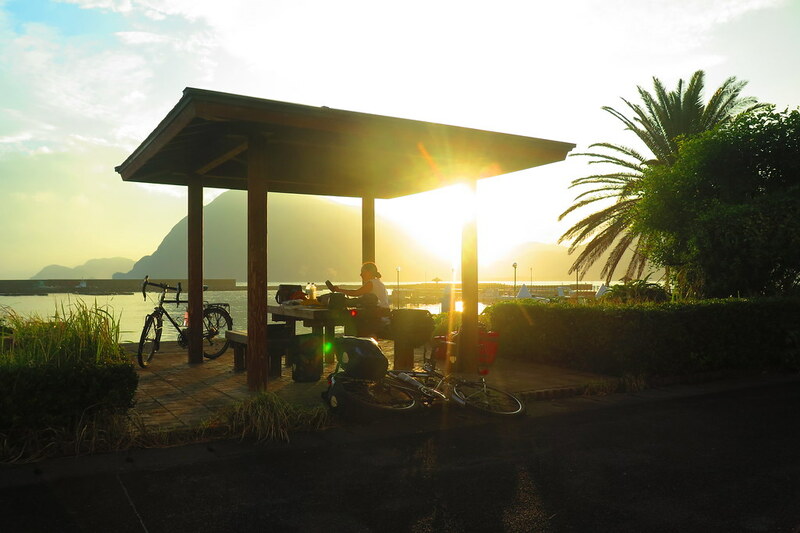 It was too good to keep riding, so we decided to take it easy and stick around for the afternoon and camp there for the evening. 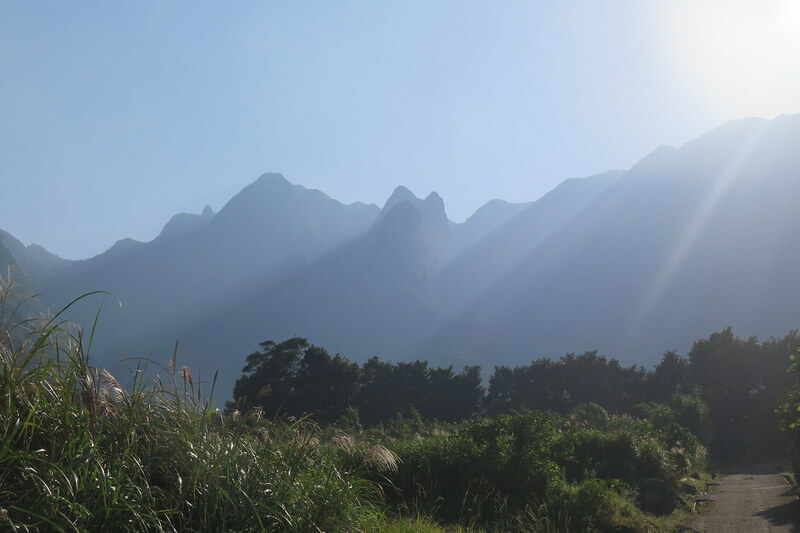 The next day was similar, following the coast south, stopping when we saw a nice view or something interesting, and generally taking it easy. There were a few hills but nothing too challenging, especially as we were moving at a mellow pace. We stopped for the afternoon at an onsen in Hyuga, just south of Nobeoka where we had our first decent wash in a few days. 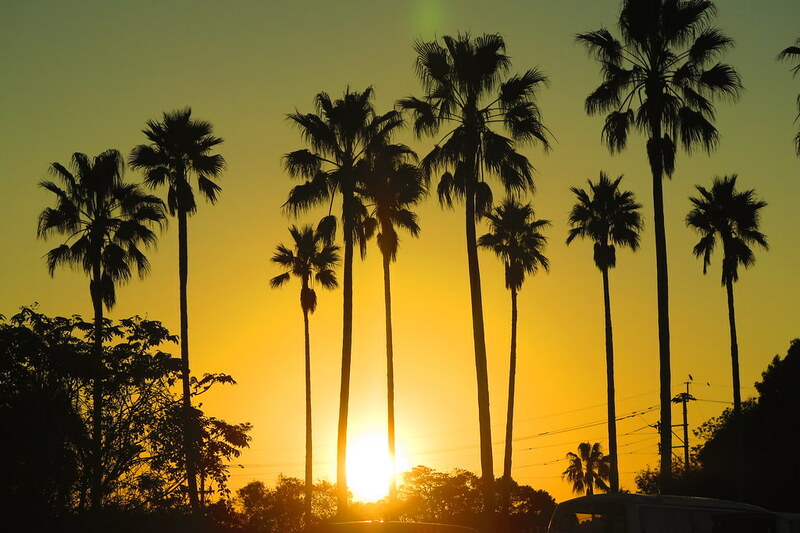 Then we camped overnight in a park surrounded by palm trees on a hill just behind. The next day over breakfast watching the sunrise, we decided to actually start getting some distance covered. 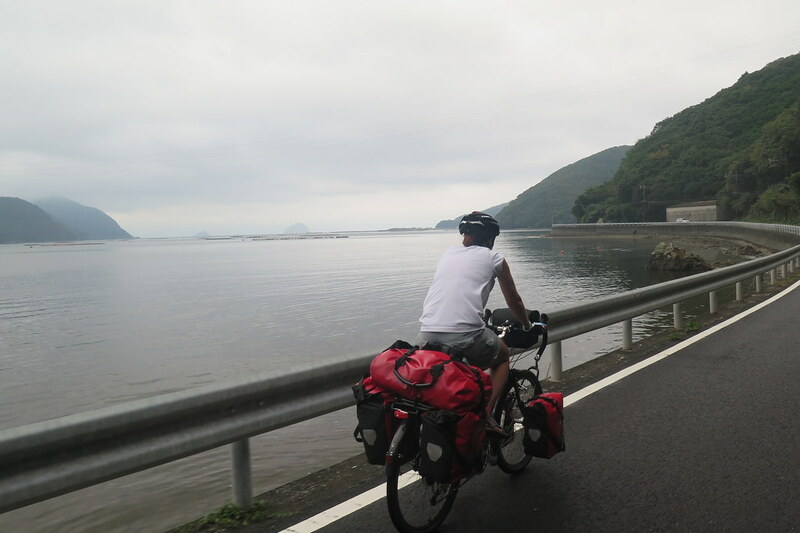 We needed to get through and past the next large city, Miyazaki, before we’d get to any more nice looking coastal areas so we headed off early and kept a good pace. 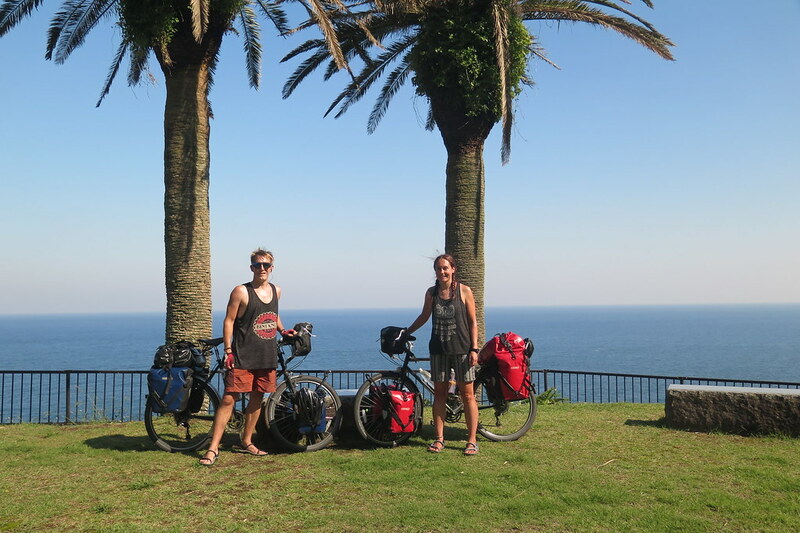 Early in the day we ticked over 2,000km which was worth a photo. Miyazaki was your standard city. Not much fun riding in, especially as we just wanted to get through and out the other side quickly. 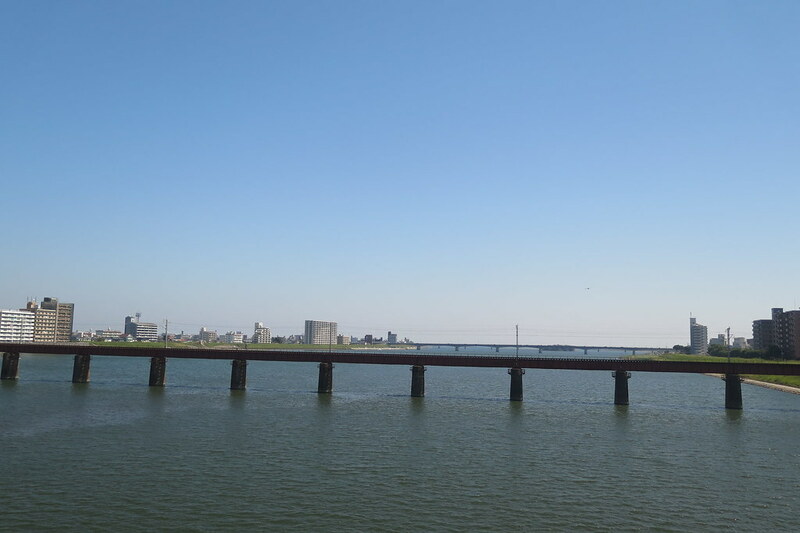 The city is divided by the Oyodo river which we’d have to cross somewhere. Again, we were cursed by an out of date map. When we got to the river, the bridge we planned to cross wasn’t there. It had been demolished. So we had to ride further inland to get across the next bridge before returning to the coast. The southern suburbs were full of bland resort hotel type buildings which we eventually got past. Then it was up onto the cliffs for even more great views and palm tree lined coastline. The rocks in this area must be volcanic as they all have very defined and interesting layers running through them. 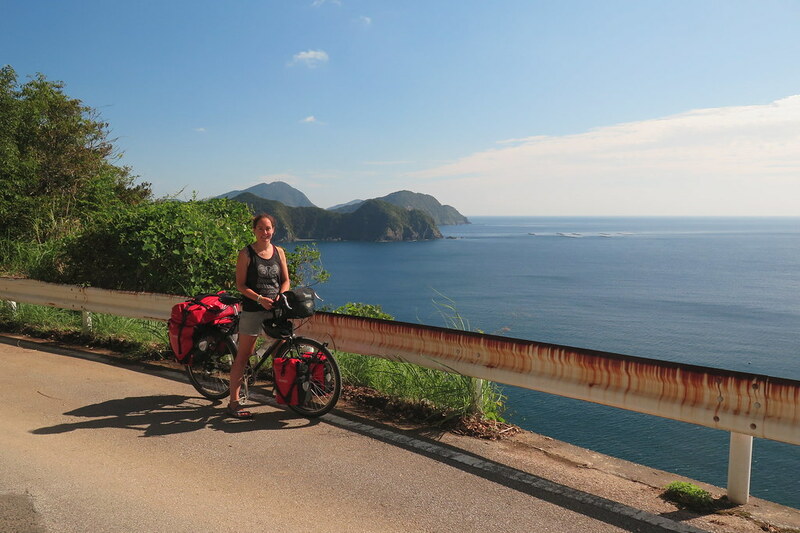 We kept pushing on over the hundred mark to take us to Nichinan town, at 109km, for our longest day so far. 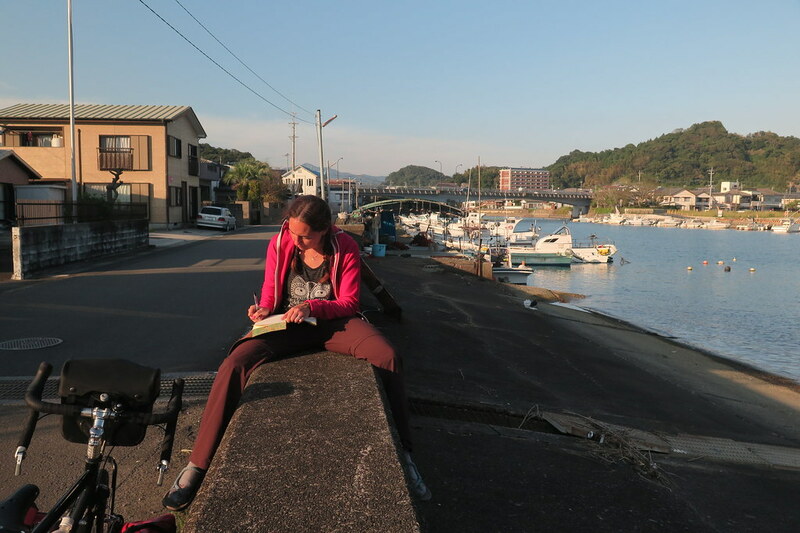 We found a place to camp in a small park next to the fishing harbour where we hung out for a while before thinking about dinner. 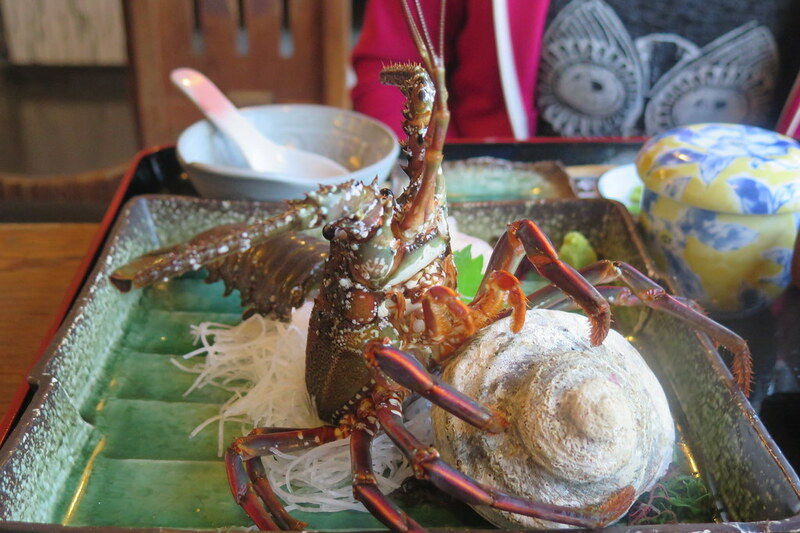 We’d seen signs for lobster outside restaurants all day as it is a speciality of the area, and in season. As luck would have it, we were camped right next to a seafood restaurant that was recommended on our map, so we decided to treat ourselves. A delicious end to a great day. 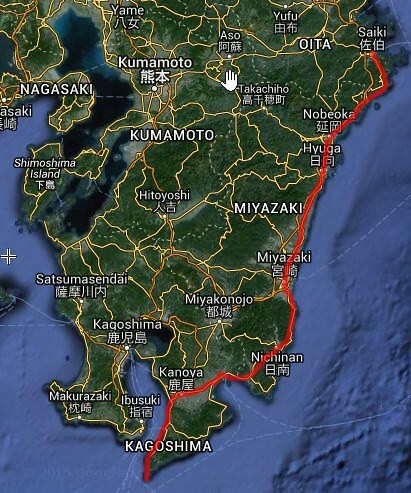 We’re getting well down into southern Kyushu by this point. 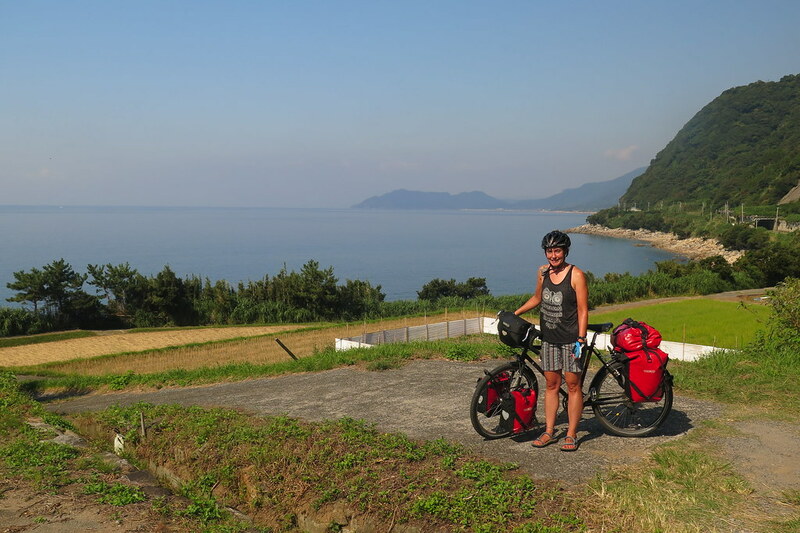 The next morning our route takes us inland across the peninsula over to the western coastline that takes us down towards Cape Sata, the southernmost point on the main islands of Japan. The weather is still fantastic, so we stopped for a coffee next to yet another deserted beach before leaving the coast. 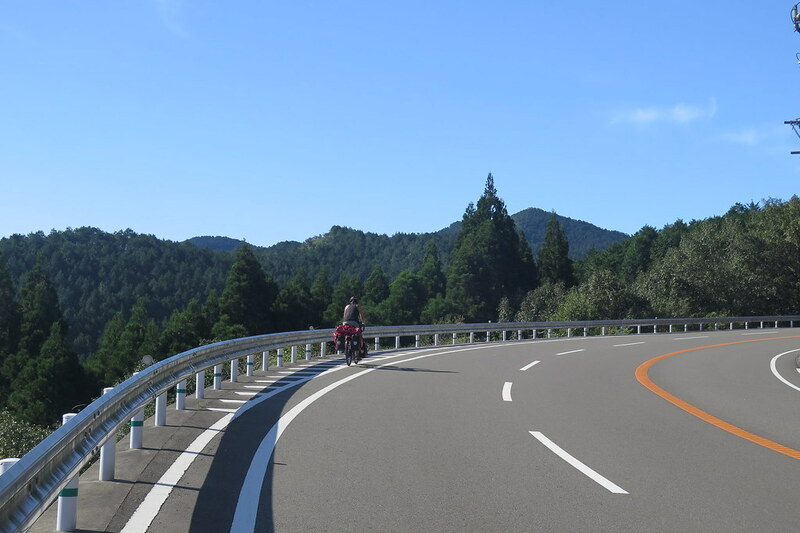 The riding was quick through mostly rural areas and one town, Kanoya. Again we racked up some decent distance and reached the opposite coastline by early afternoon. 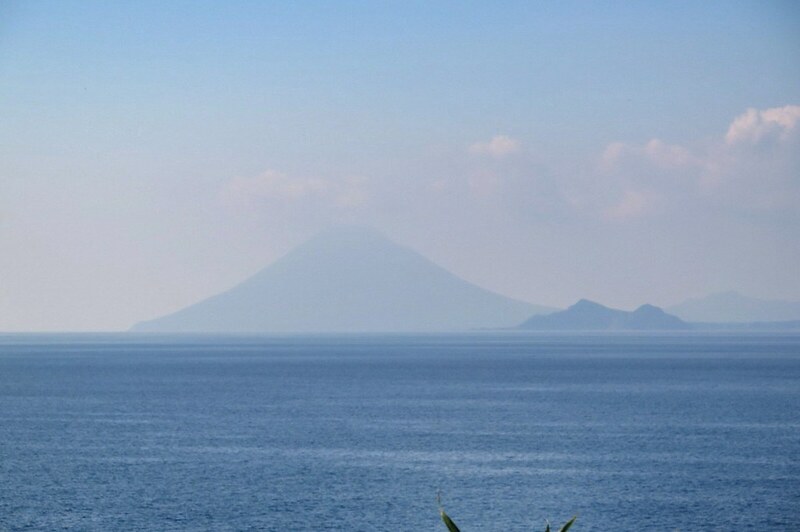 Over the other side of the bay is a conical volcano which looked just like Mount Fuji, or Hokkaido’s, Mount Yotei. 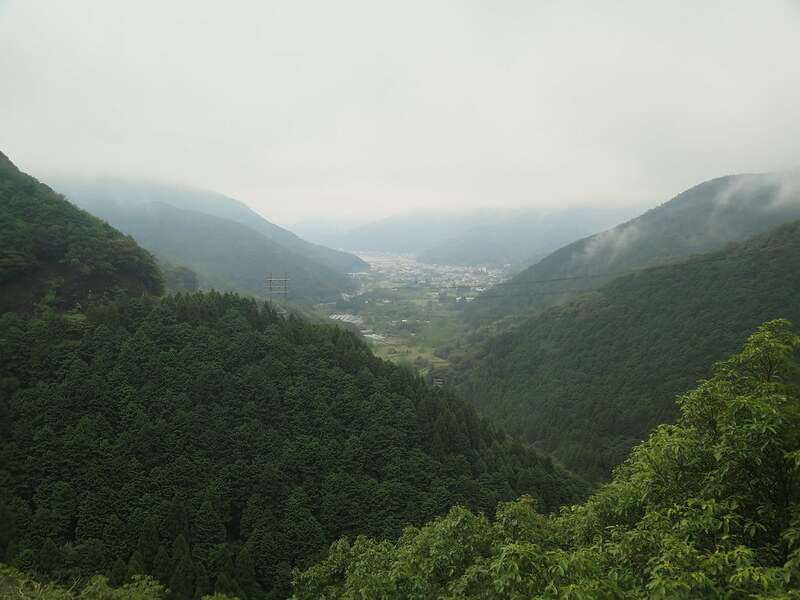 We later found out the name of it, Kaimondake, 924 metres tall and one of Japan’s 100 famous mountains. 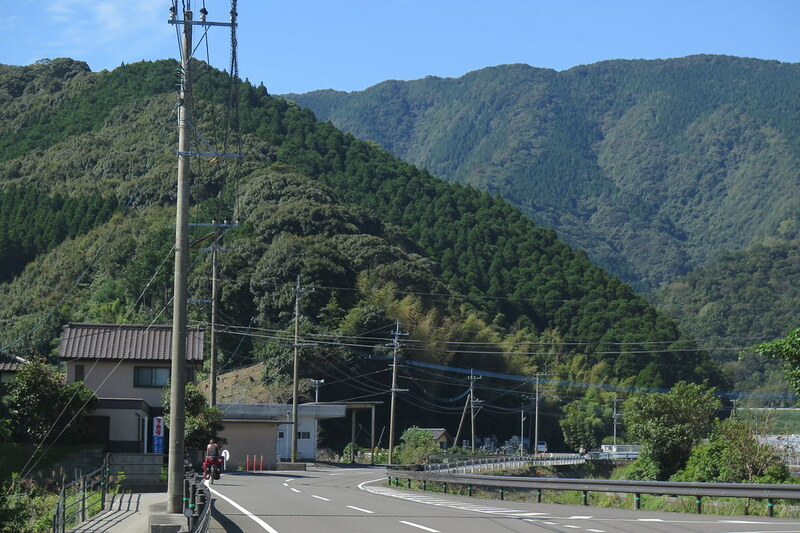 Looking ahead on the map, we saw the dream combination – campsite, onsen and convenience store, all next to one another at Kamikawa. 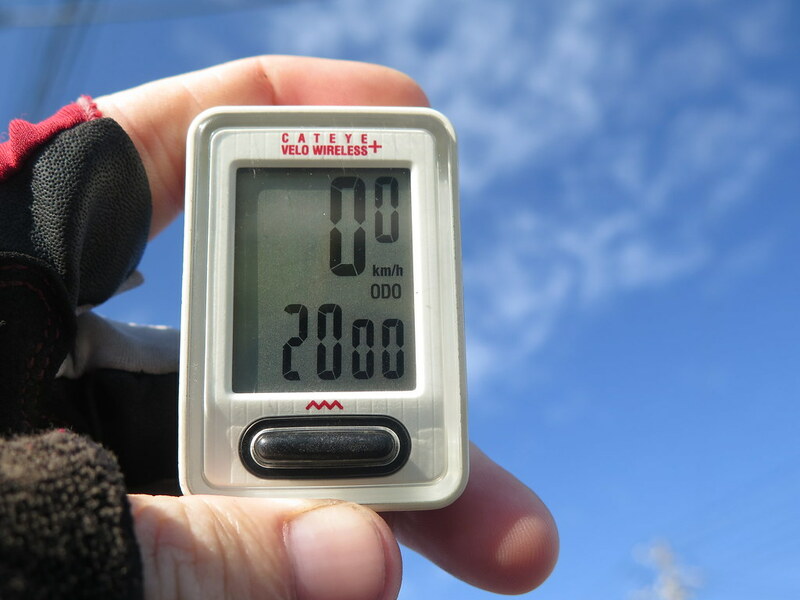 Total for the day was just over 90km, giving us a 2 day total of 200km. 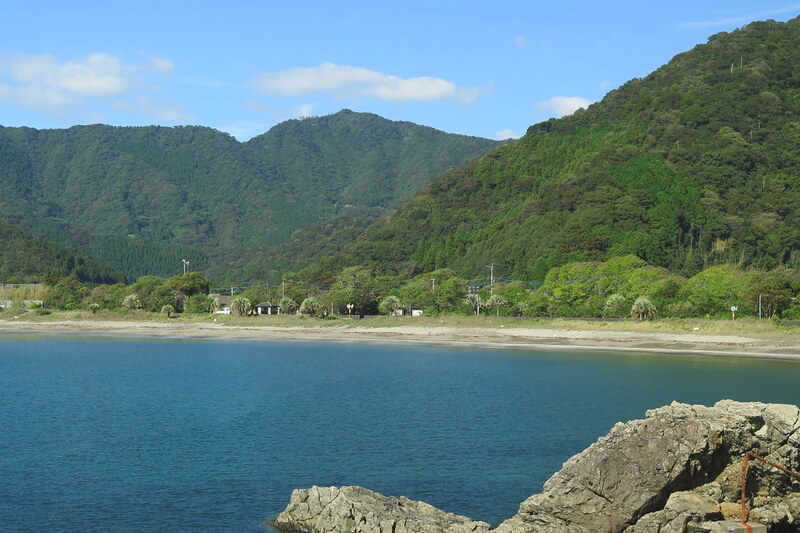 The onsen on the cliffs was a steal at 300 yen, and the campsite was free, even better. 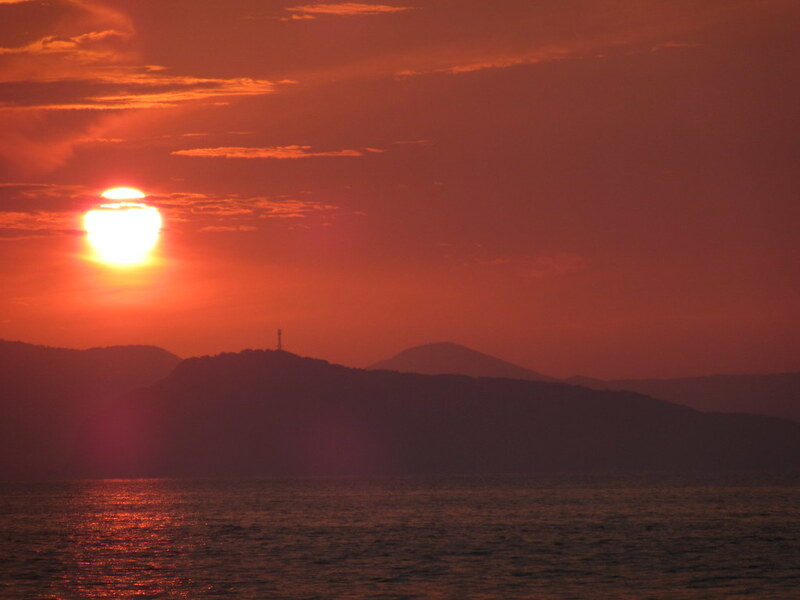 Being on the western coast, we also got yet another sunset to go with our dinner. The next day we planned an out and back ride to the Cape. 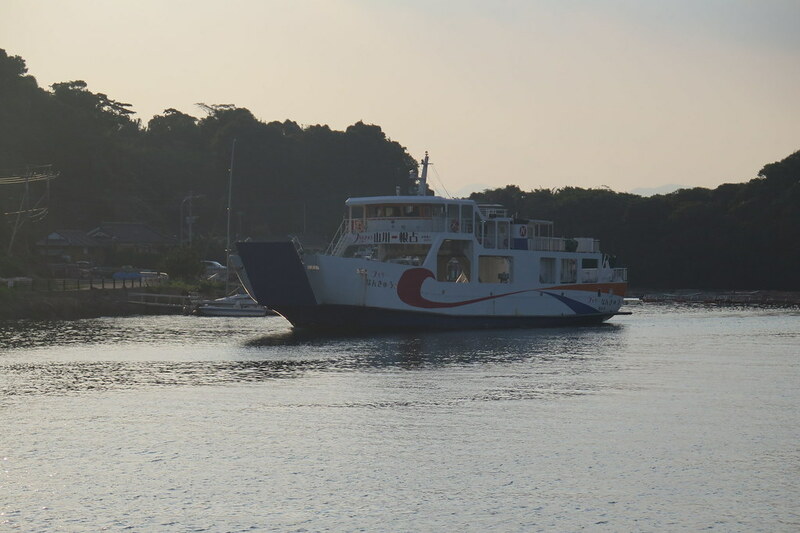 Then we’d catch the ferry over to the other side of the bay and head north towards Kagoshima. 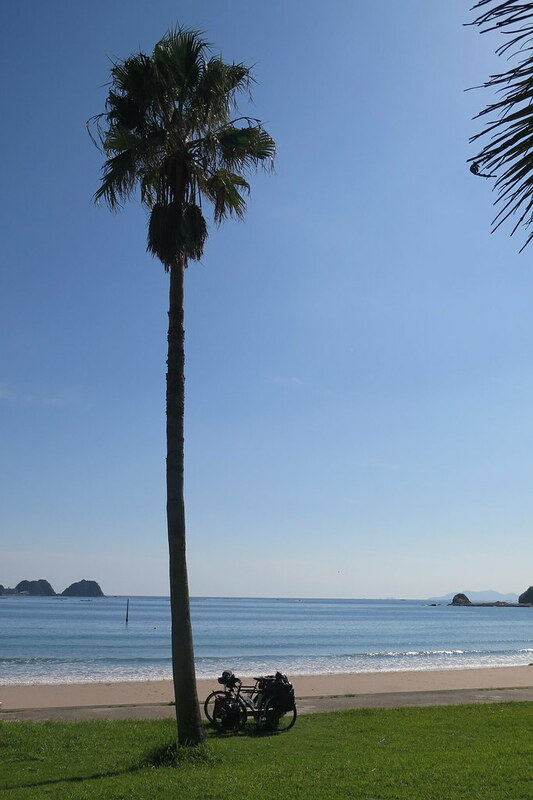 Yet another sunny day (Kyushu weather reporters must get bored!) and early start for us. 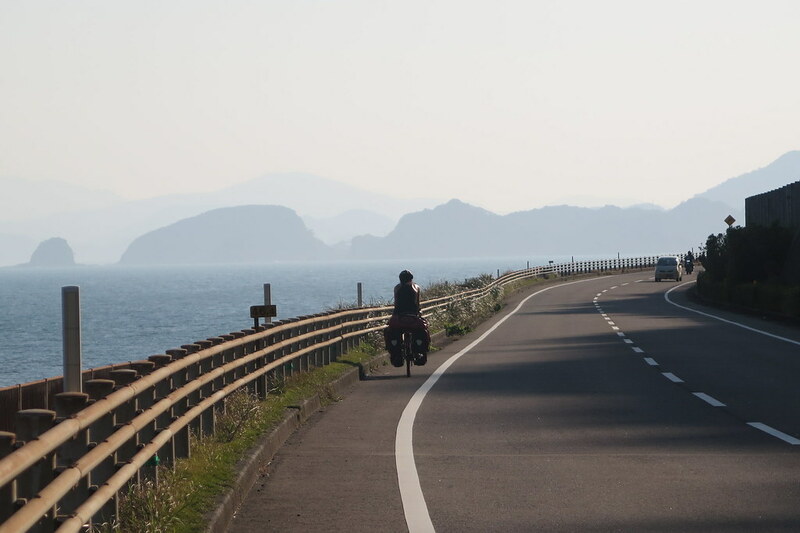 Initially the road was quite flat, between the mountains and the sea through small fishing towns. 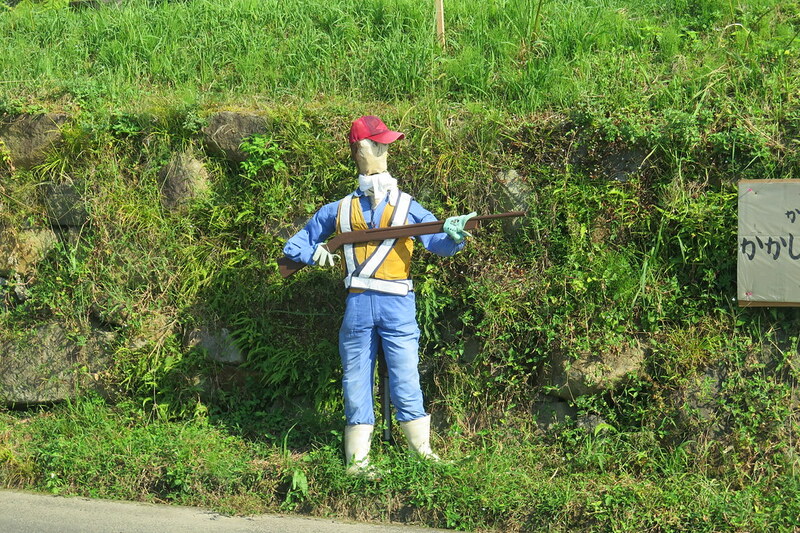 In one village we went through, there were dozens of stuffed scarecrow type figures dotted alongside of the road looking pretty creepy. Especially the one carrying a rifle. After the last village on the cape, the road got very hilly. Three or maybe four times it climbed up to a pass or a tunnel and then dived back down to sea level. 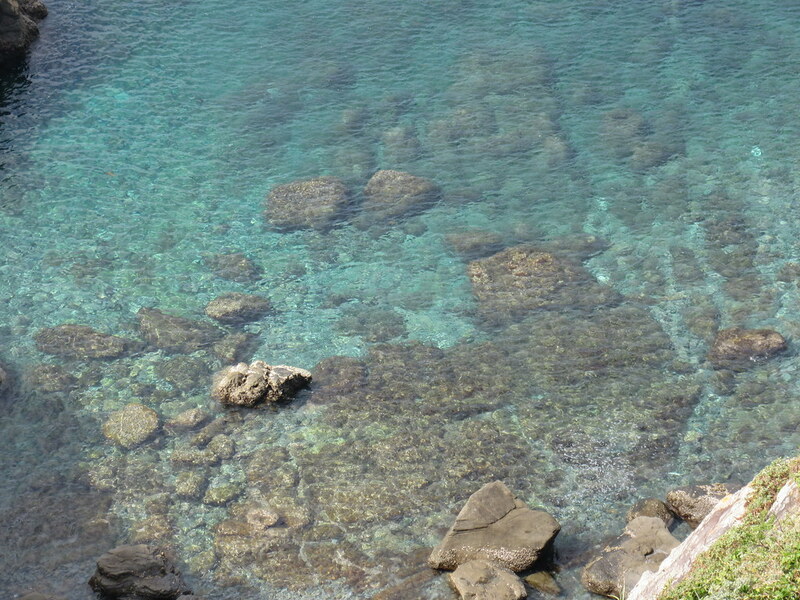 The sea was crystal clear and a gorgeous blue green colour. If we weren’t aiming to catch a ferry later, we definitely would’ve gone for a dip! It felt like a very tropical area too, with palm trees, butterflies and all sorts of colourful flowers and fruit beside the road. 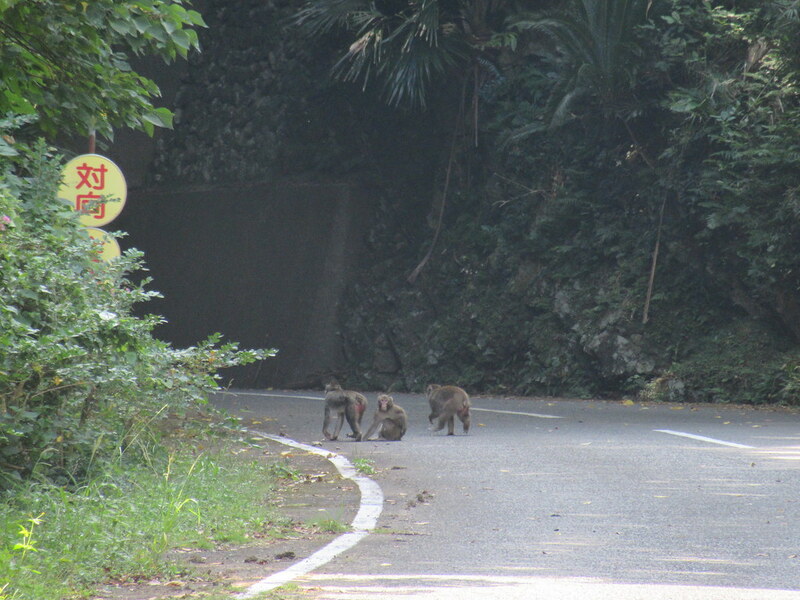 We also saw a load of monkeys, and some wild pigs in the forests. 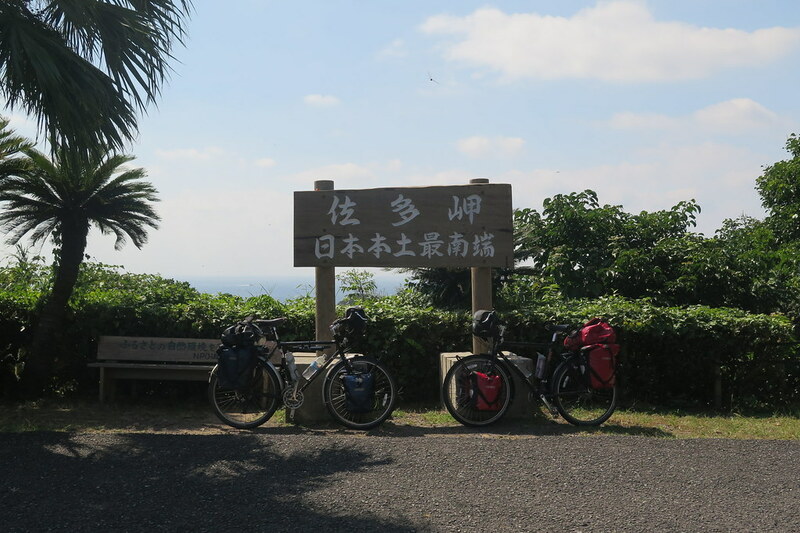 After about 45km of ups and downs, we reached a sign beside the road and a small carpark where the road ended. From here it was another 800 metres along the headland on foot to get to the cape, which was marked with just a humble sign. No souvenir shops, no restaurants or vending machines, just a small clearing on a cliff. Very understaded. Leaving the cape there was a pretty cool sign back to Cape Soya, the northernmost point in Hokkaido. 2,700km away apparently. Slightly further than we’ve done, but we took a few ferries. From here, we’ll be heading north for a while. We retraced our steps as far as Nejime, stopping for a rice bowl and some soba noodles en route. 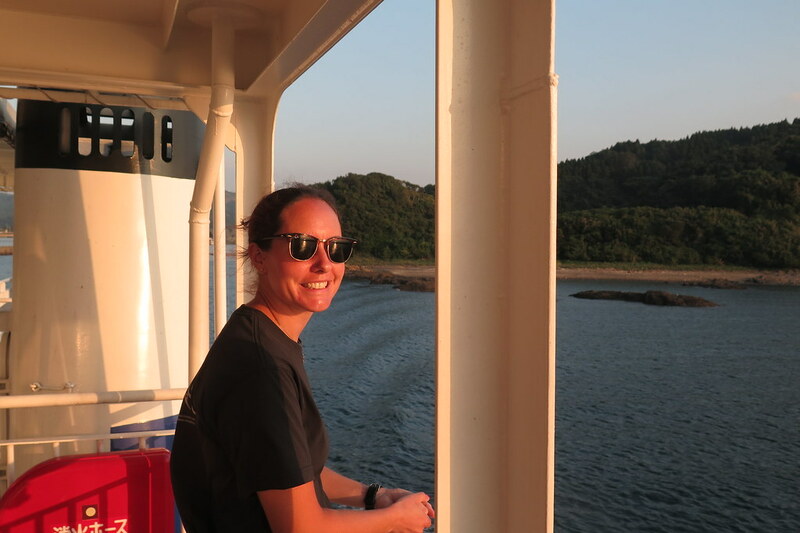 We took the 5 o’clock ferry over to Yamagawa which is about 50km south of Kagoshima City. 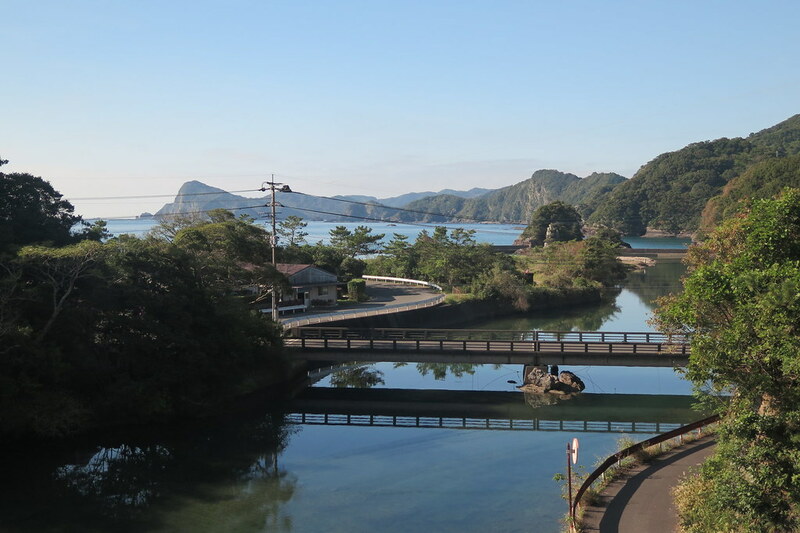 We’ve got just over a week left in Japan so we’ll be working our way north along the coast and islands on the west of Kyushu to Fukuoka. Here’s our route so far. Love reading your stories and seeing the beautiful photos, an amazing experience you’re both having! Travel well!